Most UFO sightings are witnessed by one person only, which makes it harder for them to convince others that what they have seen was real and not just their imagination. However some encounters take place with multiple witnesses being present. While most UFO enthusiasts are familiar with the Belgian Wave or the Phoenix Lights incidents, there have been many others that are not as well known or discussed. Even if these events are not alien in nature, the fact that so many people witnessed the same events at the same time means that “something” took place, and that it is not purely the products of people’s imagination. ​As it hovered over the witnesses, it was noticed that the strange humming had ceased and the craft simply hung in the air in chilling silence. Several minutes after it first appeared, the humming began again and the disc shot off at great speed. The UFO sightings in Hudson Valley in the early-to-mid 1980s had multiple witnesses but are not often discussed. This was just one of many UFO sightings in Hudson Valley in the early 1980s, and not the only one to have multiple witnesses to the event. On 24th March 1983, there were so many reports of a sighting of a strange craft and weird lights in the sky of Yorktown that the town’s switchboard almost went into meltdown. 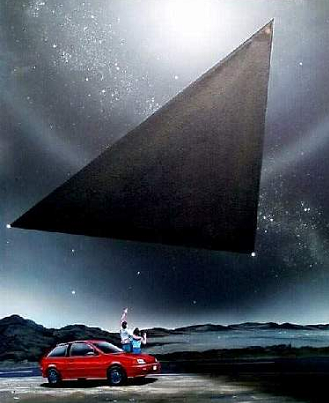 That evening the Taconic parkway became gridlocked with vehicles that had been stopped suddenly by mesmerized drivers who now stood beside their cars staring up at the assumed UFO passing over them. You can read a little more about these incidents here and check out the video footage below. Almost two decades later in 2001 over the Arthur Kill River near the New Jersey Turnpike an event took place that was witnessed and reported by numerous people. On the evening of the 14th and into the morning of the 15th July 2001, fifteen people witnessed strange golden-orange lights over the Arthur Kill River at the New Jersey Turnpike. 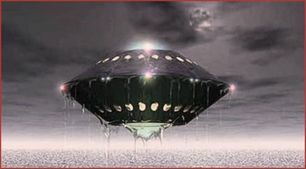 They appeared to be in a V-formation, although it wasn’t clear from the many accounts if the lights were separate entities independent of each other, or if they were the lights of one large V-shaped craft. Others reported that the lights were in a more “scattered” formation, and that one by one they simply disappeared into the night sky. Newark Airport was contacted and they reported nothing unusual on their radar, and the National Weather Service also made no reports of any unusual weather that evening. An event known as “The Cosford Incident” occurred in western England in 1993. 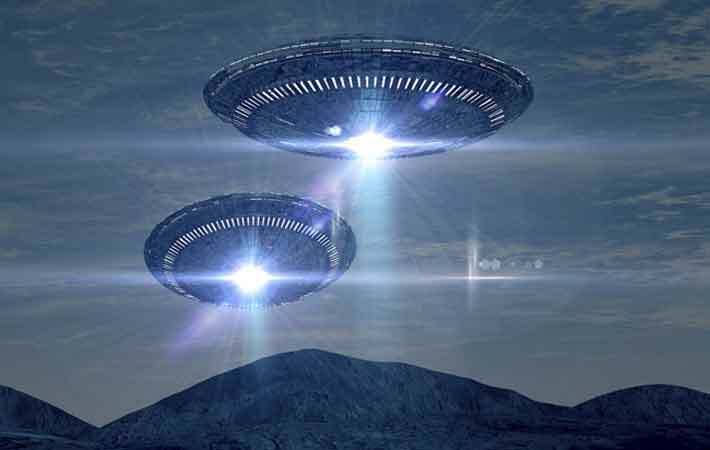 According to UFO expert Nick Pope, over one-hundred people reported witnessing a UFO on the evening of 30th March and into the early hours 31st March 1993 – many of them active police and military personnel. Pope worked on the case personally as was his remit during the time he spent with the British Ministry of Defense from 1985 to 2006. ​Most of the sightings described triangular craft that moved through the night sky at a blistering pace. One particular witness – a policeman – who had been with a group of scouts on the Quantock Hills in Somerset, described what they saw as “like two concords flying side by side and joined together!” One family in Staffordshire claimed they had seen the object land in a field near a road on which they were driving. Some claimed a craft landed in a field during the "Cosford Incident"
There were further reported sightings in Cornwall, Devon and West Midlands, as well as sightings over two RAF bases in Shropshire, RAF Shawbury and RAF Cosford. Neither base managed to pick up the mysterious craft on their radar, something that Pope described in his report at the time of being of “considerable defense significance” that should be investigated further. 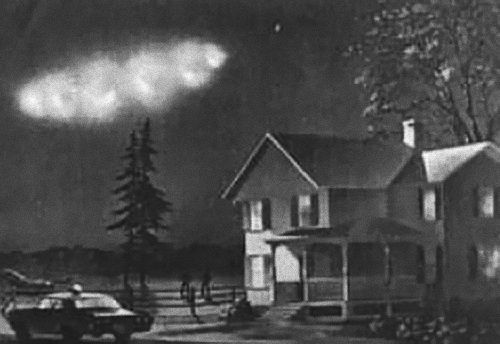 The incident is regarded by many ufologists as a very significant event, although sceptics argue that what had been seen was the re-entry of a Russian rocket carrying the satellite, Cosmos 2238 – something that Pope stated at the time was possible for a cluster of the sightings – particularly those that were witnessed just after 1am in the early hours of the 31st March. However in a further twist to the incident, Pope made note that experienced ufologist, Jenny Randles, had long stated that UFOs appeared to have an interest in such re-entries as that of Cosmos 2238, and that not all of the sightings that evening fit into the timeframe of the rockets re-entry. You can read in detail about this incident here and check out the short video below. Strange spherical lights had been reported relatively regularly off the coast of the Baltic Sea from the beginning of August 1990. By 24th August the lights appeared to have moved inland and were reported by residents of the coastal town, Greifswald, in eastern Germany. The strange spheres at first hovered in the air completely motionless for around thirty minutes, with many witnesses managing to capture photographs and even video footage. The case is regarded as one of the best documented cases of a UFO sighting. It seemed that the lights consisted of two separate sets of lights, with the first forming a circle and largely remaining still – when they did move they moved as one. The second set of lights seemed to be in the shape of a Y, and did appear to move independently of each other. Although the sighting is not terribly “exciting” their appearance is a genuine mystery, with both sides of the spectrum – from MUFON to mainstream scientists - being unable to offer any solid or satisfactory explanation. You can read about this incident here. Some of these multiple sightings date as far back as the 1950s, with plenty of records of their occurrence. As well as being seen by numerous military personnel, the UFO sightings on the evening of 5th August 1953 near Ellsworth Air Force Base were also witnessed by forty-five concerned residents of nearby towns. The first sighting was reported just after 8pm in the town of Blackhawk, when a volunteer member of the Ground Observer Corp, Mrs Kellian, reported seeing a strange glowing red light in the clear night sky. As she was trained to do, she reported her sighting immediately, and was eventually put through to the on-duty radar operator at Ellsworth Air Force Base. The craft was picked up on radar and was clearly heading towards the base. Using aircraft that were on patrol in the area, a F-84 plane was directed towards the object to make visual contact – which they soon did, and reported the red light to in fact be a stationary silver craft. As the F-84 got to within three miles of the unknown craft, it went into motion – and it moved fast. The F-84 attempted to give chase but was unable to match the speed of the mysterious craft and returned to Ellsworth. A second F-84 made its way to the area, also confirming that he could visually see the object. He too though was unable to keep up with it and also suffered strange malfunctions of his aircraft. Despite these events having multiple witnesses, many of whom like Mrs Kellian had training in observing objects in the sky, sceptics have essentially put the sighting down to misidentification and mass hysteria. You can read about this in more detail here. ​In October 1957, the Brazilian Navy set up a scientific research base on the island of Trinidade, which sits around six-hundred miles from Bahia, Brazil. In January 1958, they were witnesses to some of the most bizarre and strange UFO sightings of the twentieth century. Almost immediately after establishing the base, personnel began to report strange silvery objects that seemed to be observing their actions. On the morning on New Year’s Day 1958, the entire garrison witnessed a strange lighting passing overhead, and the following evening, a glowing object circled around one of the Navy tow ships for ten minutes, executing sudden and precise turns as it did so. On 6th January, having just launched a weather balloon, Commander Carlos A. Bacellar – who was the chief officer on the base – realised the signals it should have been emitting had suddenly stopped. When he looked up to the sky he saw the balloon approach the underneath of a cloud, before witnessing it being “sucked up” into it and disappearing. Ten minutes later, the balloon appeared above the cloud, but it was without its technological instruments – as if they had been stripped away. A little while after the balloon’s reappearance, a silver object exited the same cloud and calmly made its way from the scene. On 16th January, the Almirante Saldanha was anchored off the coast of the island preparing to return to Brazil. The entire crew witnessed a strange bright object making its way over the ship and towards the island. One of the witnesses, Almiro Barauna, managed to take several photographs of the airborne craft. Once the photographs had been developed, they were promptly released to the press. In the coming weeks it was revealed that the Almirante Saldanha had been tracking an unknown object in the hours leading up to the sightings, and that the ship had experienced numerous electrical malfunctions during this time. There has however, been no explanation for any of the events the research team witnessed. You can read more about this incident here and check out the video below. Norman Muscarello was hitchhiking home to Exeter, New Hampshire in the early hours of 3rd September 1965 when one of the strangest UFO encounters began to unfold. Making his way along Route 150 patiently looking out for his next potential ride, Muscarello noticed a strange light in the dark early morning sky. By the time the eighteen year old realised the light was in fact an object, it had already covered a vast distance and was heading straight towards him. The craft was reported to have lights around its base and appeared to wobble as it made its way towards Muscarello. Fearing that he would be struck by the strange craft, Muscarello flung himself to ground on the roadside. The object still appeared to be heading his way, but then without warning, it changed direction, leaving him lying at the side of the road, not quite sure what he had just witnessed. Muscarello dragged himself up from the ground and fled the area as quickly as he could. Around an hour earlier a short distance away on Route 101, Eugene Bertrand, an on-duty policeman, came across a parked vehicle at the side of the road. In it sat a woman, who frantically informed Bertrand that she had been chased by a “flying object” and proceeded to point to a light some distance away from them. Bertrand assured the woman it was nothing to be concerned with, genuinely believing the lady had been mistaken and went on his way. It was around 3am when he received a call from the desk officer at the station, Reginald Toland. The young hitchhiker, Muscarello, had made his way to the Exeter Police Station and had frantically informed Toland of what he had seen. He described the mysterious object as “the thing” and stated that it was at least as big as a house. Bertrand returned to the station, and after listening to Muscarello’s story himself, he proceeded to drive the young man back to Route 150 to investigate for himself. The two men soon spotted the strange craft shortly after parking up on the same stretch of road where Muscarello had first witnessed it and exiting the vehicle. As it had done before, the object moved closer to the pair, who unnerved, quickly made their way back to the police car. The object hovered in the air approximately fifty feet from them, before taking off and making its way over the trees and out of sight. It appeared to be heading in the direction of nearby Hampton. Sure enough almost as soon as Bertrand drove himself and Muscarello back to the station at Exeter, did calls begin to flood in of further sightings. One was from a fellow police officer, David Hunt, who witnessed the craft heading in the same direction as the two men had seen it moving, towards Hampton. Another came from a reporter with the Haverhill Gazette, Virginia Hale, who spotted the strange object stationary above a neighbour’s house for several minutes. Bertrand made several attempts to have the Air Force look into the incident, but their only response (which came with great delay and repeated requests) was that the sightings were nothing more than natural aerial phenomena. For further reading on this click here - also check out the short video below from David Hooper, which recreates the events of that evening in Exeter. ​Perhaps one of the strangest multiple witness UFO sightings came in Eastern Cape Fort Beaufort, South Africa in 1972. Although Bennie Smith believes without doubt that he and his farm workers witnessed a strange craft over his farm on 27th June 1972, he firmly believes that what they witnessed was a top secret military craft as opposed to visitors from another world. Smith’s farm sits around 12km away from Fort Beaufort, a town on the eastern cape of South Africa. On that June morning, Smith had found his workers cowering in a shed on the farm, stating that there was something strange hovering above the trees in one of the fields. Smith went to investigate and did indeed see a strange object, which he promptly fired upon with his .303 rifle. He maintained that his aim was correct and that he did hit the target, but the bullets had no effect. Smith contacted the local police, who arrived just in time to witness the craft landing on the ground. It appeared to be the same shape as an oil drum, with three distinct “legs” underneath it and was a metallic black colour. One of the policemen, Sergeant Kitching, also fired his weapon at the craft, only this time it appeared to react to the discharge. The strange craft began to change colour, going from black to green, and then to yellow, before finally becoming a pale white colour. A “whirring” sound could then be heard by the witnesses, before the craft took off from the field and vanished. ​Upon investigation following its departure, three indentions had been made in the ground where it had landed. More recently, particularly with the spread of social media and the Internet, sightings that would have in all likeliness remained known only to local residents have become known worldwide. On 11th August 2014, hundreds of people in Houston were witness to a circle of lights in the evening sky. Pictures spread like wild fire over social media accounts, but when video footage of the encounter was made available on the Internet, it became apparent that the lights were moving independently and were not a static circle. Although vice president of Astronomy at the Houston Museum of Natural Science, Dr. Carolyn Sumners, stated that with UFO sightings there is a need to figure out what else it could be instead of aliens, no official explanation or theory has been made available. 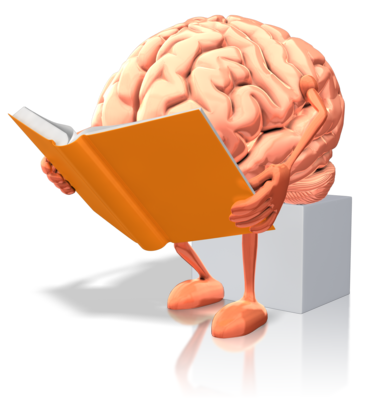 Witnesses to the event have their own theories as to what they saw. Not surprisingly many feel the lights were extra-terrestrial in origin, although some believe that they could be a government drone, or even the reflection of lights from the nearby football stadium. At the time of writing though, the strange occurrence is still unexplained. Another sighting happened during a sports event in front of hundreds of people. During a minor league baseball game between the Vancouver Canadians and the Everett Aquasox at Scotiabank Field at Nat Bailey Stadium in Vancouver, Canada, hundreds of people had their attention drawn away from the game due to the appearance of a strange object over the field. The object appeared to be a triangular shape, with lights around its edges. Even the players themselves seemed to notice the object, with one tweeting after the contest about the “alien spaceship” that had been seen. Many photographs and video footage flooded social media, but no official explanation has been offered. A local newspaper speculated that as opposed to otherworldly beings, the strange object could have been a remote control helicopter. Although the object disappeared as quietly as it arrived and without incident, perhaps interestingly Vancouver had more UFO sightings in 2013 than any other Canadian city. According to a Canadian UFO survey, 116 reports were made of such sightings in the city. You can check out video footage of both of these more recent sightings below. ​ Do Our Oceans Harbour Alien Crafts? What Are All The Strange Reported Sightings At Sea? There are numerous strange sightings of crafts entering or leaving our seas and oceans - are they alien ships or something else? ​Reagan, The “Star Wars” Project, Black Budgets And Project SERPO – Do Secret Space Programs Exist?